Posey Cufflator Endotracheal Trach Tube Inflator and Manometer is a durable, dependable, accurate and easy-to-use pressure indicator. 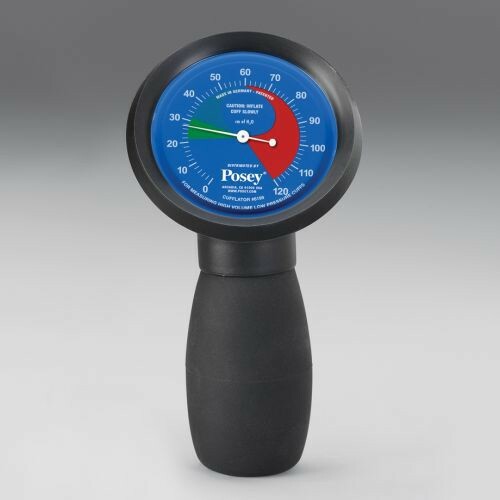 This pressure indicator completely eliminates the need for syringes, electricity or complicated connections usually required to check cuff pressure. Posey Cufflator Endotracheal Trach Tube Inflator and Manometer is equipped with an air vent button and inflator bulb to quickly adjust cuff pressure. The inflator's gauge on this manometer shows the recommended pressure range in centimeters of H20. The inflator may be left in place for constant monitoring. Eliminates the need for syringes, electricity or complicated connections required to check cuff pressure. Air vent button and inflator bulb adjust cuff pressure quickly and easily. Inflator's gauge shows recommended pressure range in cm of H2O. The inflator may be left in place for constant monitoring. we use the Posey cuffalator at the hospital that I work at. We generally check cuff pressure once per shift. Regardless of what the cuff pressure was set at, when we re-check it, the pressure is significantly low. For example, if the cuff was set to 30cmH2O by the previous shift, when the next shift comes on to check it, it will read 0, or 10cmH2O. we then have to pump it up again to what it was set to previously. we generally do not leave the cuffalator in line because we have more patients than cuffalators. Why is the reading so low each time we re-check the cuff? Shouldn't it read what it was set to previously? Hi there! I am inquiring about bulk pricing for the cufflator. Do you offer a discount? Thank you. Bulk discounts are typically handled by our business-to-business department. Please call 800-397-5899 and ask for our Business to Business department. Cufflator Endotracheal Tube Inflator and Manometer used to monitor cuff pressure without the usage of electricity or syringes. It includes inflator bulb and air vent button which adjusts our cuff pressure easily and quickly. The product is available in affordable sizes and can be carried in our pocket. It is also may be left in place for constant monitoring. A very accurate tool to use. The manometer is easy to read and understand as it measures in cm H2O. It is also very convenient as you don't need to remove it every time. You can leave it in place so that you can monitor the patient's reading every now and then. I use it to teach my students how to monitor cuff pressure. It is very dependable, accurate, and easy to use. This tracheal cuff inflatorsand manometers around eliminates the need for syringes, electricity or complicated connections required to check cuff pressure.